THAT PERIOD SHOULD REMAIN ABREAST OF THE LATEST WEATHER FORECAST. PULL IN COLDER AIR FROM THE NORTH. RAIN ACROSS THE SOUTH. 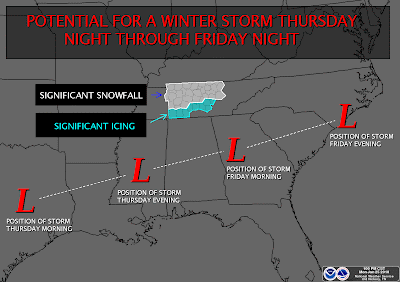 SNOW AND ICE ACCUMULATIONS ARE POSSIBLE. SNOW AND ICE ARE LIKELY. ACCUMULATIONS TO THE NATIONAL WEATHER SERVICE IN NASHVILLE. Sitting outside the Algood Wal-Mart at 11:15 this morning, watched the temp plummet from 46 to 35 in a matter of 10 minutes or so as a wall of thick dark clouds scooted overhead and masses of white snow globs pelted my car. Incredible! Wow, looks like Nat'l Weather service really is taking this upcoming weather VERY seriously. Their wording makes it sound very severe. I know it will be very tough, but do you have any type of expected accumulation at this time when this is all said and done? How is Lawrenceburg going to fare in this, will we get more snow than ice because we are more west or what?